Everyone in business or marketing is (or should be) fully aware of how useful YouTube is when it comes to online video advertising. It’s an easy, accessible and powerful way to put your product or service directly in front of the people that count (the customers). However, many brands and organisations miss out on most of its power by not managing their YouTube page effectively. Spending time, effort and resources producing an engaging and powerful video marketing asset is pointless if you just simply “Stick it up on YouTube!” YouTube isn’t just a place to dump your videos, it’s a social media platform in its own right and just as with <a href="https://www france viagra sans ordonnance.facebook.com/4416films”>Facebook and Twitter, managing the channel effectively is key to maximising customer engagement. So here are our tips for getting the most out of YouTube and your video marketing assets. Creating and uploading your logo and images to your YouTube page should be a no-brainer. You can upload banner artwork and thumbnails which will instantly make the page feel more professional and engaging (YouTube can feel a little sterile without these). This is probably the single most valuable aspect of YouTube and successful online video advertising, yet stunningly, it’s one of the things that many brands forget. You can include a clickable URL in both your ‘about’ section and in the description of each and every video. Remember YouTube is the world’s second largest search engine so if your website URL is not on your channel anywhere you could be missing out on a significant amount inbound of traffic. When a user first lands on your YouTube page you can specify which video you would like to appear/play in the main (larger) window. This is called your ‘featured video’ and is a great way to keep your page current (by updating it often) or to ensure that visitors see your ‘brand overview’ video first before they start looking at more specific video content. If you’re lucky (and wise) enough to have multiple video marketing assets then playlists are a great way to help your viewer navigate around your YouTube channel. We’ve all visited YouTube pages that are simply a long list of video titles so by allowing the viewer to filter based on content or subject makes the user experience much more enjoyable. So this should be a given but just in case you’re still not doing this: make sure you properly name your video, and get creative with the title. You don’t need to simply go with “Brown’s Hairdressers film” or something equally as mind-numbing. Instead think about using a question for the title, e.g. “How can I find the best hairdresser?”. Think about what people might type into search engines and also what they are likely to click on. Make your title relevant to both popular searches in your industry and also something that has an element of appeal and you’ll see your clicks rise significantly. Finally remember that YouTube is social so to maximise your online video advertising you may want to encourage discussion on your video marketing assets by adding a few comments. So there you have it. As mentioned many companies out there still rely on the “stick it up on Youtube” approach but hopefully for you they are your competitors. Get your YouTube channel right and you’ll steal a significant advantage over them. In a world where businesses market themselves extensively online, and customers have demonstrated their high levels of engagement with online video, it’s not surprising that businesses often turn to sites like YouTube and Vimeo as the first choice online video marketing tools. As we’ve discussed in a previous blog, the compatibility of the playback software on these sites is universal, and they enjoy consistently high levels of popularity. However one approach that’s often overlooked and yet should be one of your key marketing tools is Facebook. Facebook possesses an incredible secret weapon that can take video marketing to a new level. Now Facebook’s video player isn’t as intuitive as the one offered by YouTube and it doesn’t give you as many viewing options as Vimeo (the precise quality level, closed captions, and annotations for instance.) BUT it is fast becoming a major player in global video sharing, and here’s why. Basically what this means (and I’m sure you will have seen this already) is that video content uploaded to Facebook automatically starts playing video when a user scrolls on to it! If it’s part of a news feed or a shared story then every user who’s connected to the sharer will also see it autoplay, and that could mean thousands of potential viewers watching quickly and easily. Well, this autoplay is an incredibly powerful and useful tool. If we place video marketing on Youtube or Vimeo and then share links on other social media platforms the user still has to physically click on the thumbnail or link to start the content playing. With the amount of content that’s out there you sometimes need fairly strong motivational or enticing elements to get that ‘click’ to happen. The user has to make an ‘opt in’ decision. But with Facebook automatically playing the video as soon as it’s in view, it offers brands a chance to engage viewers even before they’ve had a chance to make an ‘opt in/out’ call. Brands can use it to connect with casual browsers in a way that feels much more at home with the social media landscape. OK, so before we get too excited about this, there are some drawbacks. When a video autoplays it does so without audio so there’s no sound. But if you produce your video marketing with powerful visuals in the first few seconds, you will encourage the user to click on the already playing video, which then triggers the sound. It almost creates the need for a ‘call to action’ at the front of your film rather then the traditional closing one. It could be argued that Facebook has the edge here when considering online video marketing tools. Sharing video on YouTube and Vimeo can be a clumsy business and let’s face it, no one really “hangs out” on Youtube or Vimeo in the way they do on Facebook. When most people share a video with friends or followers they do so on Facebook. And with Facebook’s autoplay that shared video is guaranteed to autoplay in every connected friend or follower’s timeline. Instant connection! With the arrival of autoplay video it is clear that Facebook understands the power of online video and the capability it has to distribute it. There are videos on Facebook with millions of views that have never been posted on YouTube, and though Facebook isn’t the biggest video sharing site or the most obvious one, the results are starting to become difficult to ignore. Add it to your arsenal of marketing tools and see what a difference it makes to your reach. Corporate video production – A guide to getting it right! We all know that when doing project-based work, effective time management is important. However in the world of creative video productions time managements becomes crucial in avoiding spiralling costs and lengthy delays. Now video doesn’t always have to be an expensive item, but get your time management wrong when producing it and your initial costs are going to rapidly climb. So here’s a few tips from our series of “how to make a promotional video” blogs on time management. Effective and creative video productions require a good solid foundation, yet some of the least effective video briefs that we’ve ever seen are always the one pagers. Providing your production team with the bare minimum at brief stage will prove counter productive in the long run so don’t rush this stage. If anything, this should be the one part of the process where time management should not be at the forefront of your mind, so don’t rush it. If you’re stuck for the correct structure of a video production brief then don’t waste time trying to invent it. You can find countless guides online to help get this part of the process moving. So keep your brief simple, concise and accurate. By investing time into this initial starting point of your production you will save countless hours of back and forth communication. Before you shoot your video, have the director and/or camera operator visit the location that the filming will take place at for a ‘location recce’. Now this may initially seem like overkill and in fact a waste of time but you’d be wrong. Getting to your shoot day with all the crew and talent on the clock only to find that the power supply is insufficient or that the background noise makes it impossible to shoot is far more expensive than allow a small amount of budget for a location recce. If a key member of the crew has performed a location recce then any and all technical issues can be flagged and averted and set up/get out times will also be reduced as the logistics will have been pre-planned. Allowing the director and/or camera operator an opportunity to see the location prior to shooting can save time, stress and money when it comes to the actual shoot day and we would wholeheartedly recommend it. Once the filming is done don’t think that you need to sit through every single frame of footage with your editor to make an edit selection. If you’ve briefed your Editor well enough they should be able to take the project right through to “edit version one”. This version one edit should be pretty much the finished article in terms of content and presentation yet allow you the opportunity to ask for any and all tweaks you desire. If the editors done their job properly these tweaks will be quick and enable you to review an “Edit version 2” very quickly. So fully briefing and trusting your Editor can save you countless hours of doing watch throughs. Within creative video productions there are 3 key people. These are the Producer, the Director and the Editor. If you have (and most corporate video projects do) multiple stakeholders in the project then always collate all comms and feedback that needs to be relayed to these key crew members. Providing them with clear and consistent communications throughout the process is critical to avoiding multiple repeated back and forth emails. Video production has many elements within that require a high degree of skill and experience. Camera Operators and Directors etc are obvious examples but don’t be afraid to also commission script writers and video production managers if your budget allows. The video production industry has probably one of the richest pools of freelance experts of any industry and by bringing in the right talent you’ll save lots of time. As mentioned this is not for all budgets but if your production allows then we always recommend getting the best people in place. Finally (and something that often catches people out) you’ll need to allow time to upload your content to YouTube, Vimeo or Facebook. Make sure you allow time within your plan to do this as its surprisingly time consuming and if rushed can undo all your hard work. To save time if you’re uploading multiple videos then you can bulk or group upload on most platforms. Once they’re uploading you can get on with other work, so factor this in when you’re thinking about the time needed. However once they are uploaded then do allow time to properly tag, arrange and share them. After all, this is how you’ll get the most bang for your production buck and hopefully it will reduce the dramas that creative video productions sometimes provide! But most importantly it will allow you to generate maximum impact from your new video marketing asset. Engaging corporate and promotional videos for businesses can be very powerful. This is something that we all generally accept. But getting your video right and harnessing that power isn’t always plain sailing. When producing video for your brand or organisation there may be numerous stakeholders in the project, all with their own opinions and ideas. Maintaining a clear structure to your production is essential as this is going to help you achieve everything that you set out to achieve (which in most cases is to drive sales). So to keep the project and everyone involved with it on track we suggest using our 3 step approach to video production. It’s simple, effective and it’s a great way to prevent projects from entering what’s known in Hollywood as “production hell”. This is where multiple stakeholder input results in greater and greater reductions in the final film’s effectiveness and power. Our 3 step approach is essentially 3 questions, the answers to which will provide a clear blueprint throughout the production. Ask yourself (and other stakeholders in the video project) these questions at regular stages in the production to help unify the production teams vision and ultimately deliver the best possible video marketing asset you can. So here are the questions in our 3 step approach to the production of corporate and promotional videos. 1 – What is your message? 2 – Who is your viewer? 3 – What outcome do you want? Simple questions. And yes, there are many other factors within most video marketing projects, however all of those other elements and the answers or direction that the require will be clearly visible once the 3 key questions are answered. Forming concise and honest answers to the 3 step questions will give you pretty much everything you need to anchor the production of your video marketing in such a way that it’s goals are a lot easier to reach. Once the answers are established and agreed, they should provide clear signposts to many other elements within the production. The answers will inform and dictate aspects of the production such as tone, style, approach, duration, and content. The answers to the questions should be one or two lines, or one sentence. You may be tempted to write paragraphs to answer each question, but this is not a test. It’s a tool. If the answers to these 3 questions are more than a single line, then there’s a danger that the final film will reflect this and have a mixed up and overly complex feel. Answer the questions in a clear and simple way and your final film should do exactly the same for your viewer. 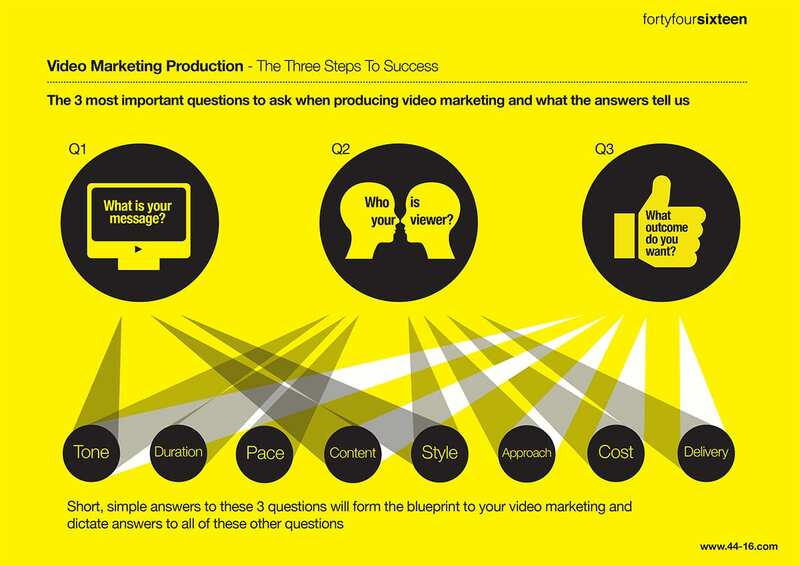 So remember, 3 questions that form 3 steps to successful video marketing production. Number 1 – What is your message? Keep it clear and simple. And don’t be tempted to try and shoehorn 20 different messages. If you do you’ll lose the viewer quickly. Remember that video marketing is essentially an elevator pitch. Number 2 – Who is your viewer? Knowing who you are talking to will identify the correct way to talk to them. By considering the answer to questions 1 and 2 you should be able to quickly find the right tone, style and pace for your video. For example we’d use a different approach if we were delivering a message about life insurance to someone in their 40s than we would if we were delivering a message about soft drinks to a teenager. So by answering the 3 step questions, answers to other questions become much clearer. Number 3 – What outcome do you want? As with questions 1 and 2, clearly identifying a desired outcome provides clarity on how many aspects your corporate and promotional videos should be produced. Of course 90% of video marketing is aimed at driving sales, but in order for the video to be effective, it’s important to know how this increase is going to be achieved. For example, do you want to entice customers into local branches? Or do you want them to visit a web page? Of course you may simply want the outcome of the video to be increased awareness and visibility of your brand or service. So in order to clearly and simply identify the outcome that you require, ask yourself this supplementary question – what’s the first thing that you want the viewer to do when they’ve watched your video marketing? Now it may seem that we’re over-simplifying or dumbing down the production of video marketing here but that’s really not the case. Successful corporate and promotional videos will have these questions at their core, whether they’re consciously identified or not. Re-visiting the questions throughout the production process helps ensure that nothing is lost in the complexities of the production and will ultimately allow you to produce video marketing that hits the spot every time. OK, so producing any video which requires shooting on location can be challenging. However if that location shooting needs to happen in London (or any other major city) then the challenges can be multiplied. Yes, some large cities will be used to seeing film crews both large and small on their streets every day, but that doesn’t necessarily mean your filming is going to be easy. So here’s a few tips and pointers based on our experiences of producing corporate video in London that may be applicable in whichever large city you happen to be shooting. Strictly speaking, for any external video shoot that you need to do in London you should apply to the Mayor’s office for a permit. There’s probably never a day that goes by when there isn’t a shoot happening somewhere in London, so the process of applying for a filming permit is fairly smooth and the Mayor’s office are very much geared up for this. You’ll need to pay a fee and be able to provide details of public liability insurance cover but obtaining a permit in this way does make life on the shoot a lot easier. However, for every shoot that happens each day in London with a secured filming permit there will probably be several more happening guerrilla style – that is to say, without any official permit. It’s a fact that within the corporate video industry budgets and time scales may sometimes make it tricky to obtain a filming permit. If your crew is small (e.g. 2-3 people and you’re not shooting a large scale project then you may be tempted to go down the “guerrilla route”.) If you are questioned by the authorities they have the right to move you on and most likely will, so be prepared to leave your locations quickly. You may want to scout some backup options in advance. Over the years we’ve produced projects using both of these approaches so we know the merits and drawbacks of each. Whatever the size of your shoot you’ll need some kit. It may be only a camera and mic or you may need multiple cameras, lights, sound and grip – whatever your needs are, you need to plan for the challenges video production in London presents for a simple task… like unloading everything! Many people don’t consider this but you can’t just stop an equipment van in most central areas (these are red routes) and car parking for vans and other vehicles can really take a chunk out of your budget. Our usual approach is to do our unloading at the first light of day so that we can quickly park/unload without any trouble, and then find a budget-friendly parking location away from the centre of town. Alternatively using couriers for your kit is useful as they can quickly pull up while your crew can just grab and go with any and all equipment. In addition to the logistics of getting kit to your location you also need to consider how your crew are going to get there. As mentioned, parking in central London is either extortionate or seriously limited so most crew for London video shoots tend to arrive by tube or other public transport. So factor this into your call sheets: tubes and buses can run late, so asking the crew to arrive earlier than required buys you some wiggle room if one or more of them are delayed. A challenge of producing corporate video in London that can sometimes be surprising is light! London is a pretty built-up place, and if you’re shooting in an area that comprises of mostly high-rise buildings then lack of light where you are can be an issue. Many streets in London will only get direct sunlight at certain points of the day (and this will change over the year) due to the skyscraper style buildings blocking the light, sometimes on all sides! So a good recce done at the intended shooting time of day is really useful. You may need to pack in some extra reflectors to help counteract the lack of light by boosting what you already have. Finally, noise. Yes, London is a very noisy place, and when you are shooting slick corporate video this can be a real pain. Even if you are in the confines of an office you’ll be amazed at the general hum and buzz that the city creates. Its something that we don’t really notice as it’s part of the day-to-day city environment, but when you come to the edit this background buzz really jumps out and can be distracting. So again, a good recce can go a long way here: check to see if there is any building work planned on your shoot day – barely a day goes by in large cities without some kind of construction work – and if your location is underneath Heathrow’s main flight path you’re going to have to time your sound recording carefully! So there you have it, just a few tips and tricks to help you produce hassle-free video in London or any other large city. As a video producer you may occasionally (or often) be required to work with a celebrity. This is usually the case where they act as the face of a brand or ‘brand ambassador’ but can also be for a variety of other briefs such as ‘behind the scenes’, or their own projects. However if you’ve not worked with a celebrity before then the process can be very daunting depending on the stature, popularity and personality of the celebrity at hand. Yes, there’s always an element of jumping through hoops and ‘playing the game’ when a celeb is on set as they are not just anyone, but that’s not to say you should be intimidated by the prospect of working with them. You’ll also need to remember that they’re not just another member of the crew and therefore their presence will require more of your budget. So here’s a few things that we’ve learned over the years that may act as a useful heads-up for any project you may be producing with a celebrity on board. In fact they can be quite rubbish in front of camera. There’s an understandable expectation that just because someone is in the public eye that they will automatically be great at giving lines to camera. Wrong! We once spent two hours with a ‘trained actress’ who was struggling to deliver four lines to camera even though it was on an autocue! People who watch our finished product are thinking how great it is – they’re not thinking about the 35 takes it took to get it. Don’t expect to be given a mobile number so you can exchange texts with the latest reality star! It’s usual (and to be honest, much safer) to send all communications to your celeb through their management. This ensures that they will actually be on set on time and on the right day. You’ll get more from them if you go that extra mile to make them feel special. So if you need them on set at certain time, send a car to pick them up (you should have factored this into your initial budget). And don’t just send any old car. In the past we’ve gone for an executive car with driver in uniform to really ensure that the talent feels appreciated from day one. Do let the celebrity you are working with see the shots you’ve got planned before you turn over. This will help you much more than you know. They will know their best angles and getting feedback on your shots before you turn over can save time and help capture them in their best light. It also fosters the relationship you have with them – if you show them you care what they think, they’ll warm to you and become easy to work with. So getting celebrities on-side like this is a key part of a successful shoot. A journalist once told us that one of the best ways to do this was to give them something of yourselves first. For instance when chatting, volunteer up some information about yourself that you wouldn’t normally tell anyone. It’s a great way to establish trust as you’ve already shown that you are willing to confide in them. I’m sure this goes without saying but instantly uploading a photo of you and the celeb you’ve just worked with to social media isn’t always the wisest thing to do. Many productions need to be kept under wraps until launch and by tweeting your latest star selfie you may cause some serious problems. The people bankrolling the production will have a plan for drip-feeding excitement for the project through their own social media channels so if you want more work like this in the future, make sure you know what’s appropriate before you get your celeb trending on Twitter. Seasoned crew members will probably have seen it all before. However for the younger crew (usually the runners) its important to ensure that you not only select them carefully but fully brief them on what is acceptable. Runners are normally newcomers to the industry entirely and can get very excited about working with celebs. We’ve been burnt in the past (one young runner simply couldn’t stop asking the celebrity questions) so take it from us, getting the right crew for the job is useful. Unfortunately (and this only applies to some and not all) there can be similarities between working with a celebrity and looking after a bored toddler. Some celebs can be strange beasts and you certainly shouldn’t expect to get a 12-hour shoot day out of them! Tantrums and tears are sadly not just the stuff of tabloid tales so handle the talent with kid gloves and you’ll ensure they stay focused and friendly. Finally, and this continues from the last point: you should expect the newer celebs or people who have only recently found fame to be more trouble than the ones who have been there for decades. Our experience has taught us that most times the more established the celebrity the easier the process is. They seem to know what’s involved and appreciate that you are there to make them look good. However the new or more recent celebs (think reality TV here) can be or are generally a nightmare. Ensure that your director has a long fuse and get a good night’s sleep before the shoot! We’ve all seen those Apple talking heads featuring Jony Ive or some other leading Apple light telling us about their seemingly monthly announcements of new phones! (lets face it, they make great video advertising!) They are shot against a perfectly white background, which ensures they feel clean, professional, and above all… Apple. So many companies would benefit from presenting talking head or interview material for their video advertising in this way. As mentioned is slick and clean but it also focuses the viewer on the person talking without any distractions. I’m always slightly disappointed when I see a corporate marketing video talking head shot with an office background. It’s hardly pushing the edge of creativity is it? So being able to create this look for your corporate video is really useful. Here’s how to do it. Essentially the key here is to treat the background and the subject separately in terms of the lighting plan. You will therefore need to light the background first, and then the subject. Now, your background can be formed in many different ways. You can hire a pop up white backdrop, use polystyrene boards, or even simply hang up some large rolls of white paper (although this will require time and delicacy). However, once you’ve got your background lighting it is pretty simple. 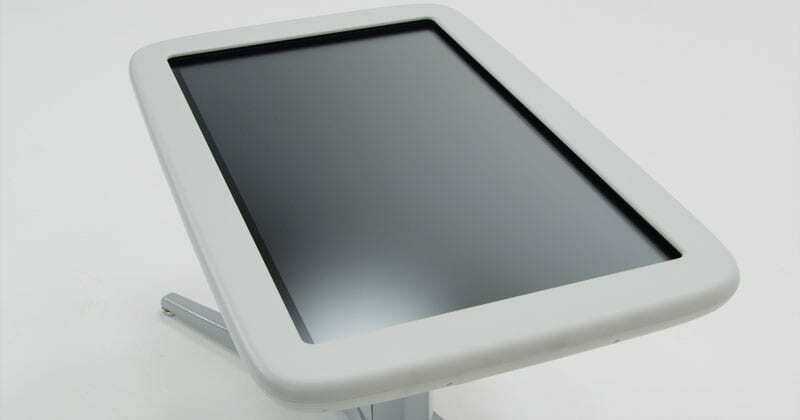 Using a couple of large soft sources such as a couple of 2K lights with diffuser or softboxes on them, you can cast an even light on the surface then adjust your exposure accordingly until you get that brilliant seamless white look you require. Next up you need to light your subject. It’s generally a good idea to place them as far away from the background as you can. Obviously you will be limited by the size of your shooting location and if you place the subject too far forward the edges of the backdrop may start to appear in frame, but this shouldn’t be much of an issue if you’ve lit it well enough with a nice flat light. You can easily add in extra areas of white in post to fill up the frame if needed though. Just make sure that the subject doesn’t encroach on the area you’re adjusting in the edit, or you’ll have some lengthy rotoscoping to deal with! So light the subject as you wish safe in the knowledge that they are now presented against that beautiful, clean, white Apple-style background. This will provide you video advertising with that desirable high end, professional feel. Many briefs in corporate video and professional video editing require the cutting down of long interviews to find the essential soundbites and answers. Hardly a project goes by when we are not faced with taking 10, 20 or even 30 minute interviews and finding the right selection of 10 second quotes to efficiently convey the message we want. In some cases we can simply send a timecoded transcript to our client and they can select the best lines, but this is sometimes misleading as what may look like the best line on paper may lack conviction and credibility when delivered to camera. This is something that can’t be communicated when simply reading words on a page. So sometimes the role of professional video editing is to trawl through the interview content and make the call on the best final soundbites themselves. But doing this can be time consuming and complex. So here’s our approach to cutting interviews down. Firstly, create a sequence/timeline and chuck every frame of the video on it. This is our starting point. Now this example assumes that only this interviewee will be used in the video and that the interviewers questions will be cut out. This is generally the case as we don’t wont to waste viewers time when watching the film having to listen to the questions being read. Hopefully the answers are delivered in statement fashion and can stand alone in conveying the message as opposed to simply being a yes/no answer. So the first task is to edit out and remove form the timeline all the interviewer’s questions, pauses in the interview recording, and false starts/outtakes etc. A quick way to do this is to use the audio waveform as an indication of when the subject is talking and simply trim everything else. So now we have a timeline containing just the stuff we want to choose from for our corporate video. Next up, copy this sequence and rename it as ‘Interviews 2nd cut’ or something along these lines. We’re now going to watch this timeline through and remove any answers that feel too long, off topic, or generally not ones that feel powerful. As we’re doing this we keep the film’s message in mind and will usually label ‘killer quotes’ on the timeline so that we can easily navigate back to them later. Once we’ve been through this second cut we should be left with our shortlist of useable comments. Now we repeat the process by copying the sequence again and re-naming it as ‘Interviews 3rd cut’ or similar. This is useful in case the client comes back to you once they’ve viewed the draft edit and requests a comment about a topic not in the draft you sent. To quickly scan a sequence and say “yes, we’ve got it” rather than trawling through all the footage again saves time and it’s a very common request. So now you should have ‘Interviews 3rd cut’ and this is really where you’ll find your narrative and identify the strongest quotes. A key part of professional video editing is not being afraid to be ruthless. You may still have 10 minutes of great comments and a target duration of only two minutes, so go with your gut and if you’ve any doubts about a particular quote, delete it from the timeline. You can now also play around with chronology and try a few comments back to back or in different orders to see what flows well and works best. If you’re cutting B-roll over the top of these interviews (and lets face it, we hope so as 2 minutes of a talking head isn’t going to light anyone up!) you’ll have some flexibility to cut into the actual quotes and answers. This is great for removing “ums” and “errs” from video marketing films that don’t sell what they’re saying, but can also be useful if you’ve got two takes of one question and you like the start of one and the end of the other. As mentioned, being ruthless here is the key, and if you are then you’ll find this third cut starting to feel like a powerful corporate video with a strong message. If you’re not using B-roll but need to cut a portion of one answer there is another option open to you. You can scale down the timeline to allow you to create a two-camera look. This is only possible if you know that your client will accept a 720p delivery and you’ve shot at 1080p, or a 1080p delivery and you’ve shot at 4K. By downscaling the size of the frame you can use the footage at 100% scale as a ‘punch in’ and then scale the footage down to match the dimensions of the frame for a mid shot. Even though it’s the same shot and we’re essentially just zooming in on it, it’s a cut that audiences will tolerate and won’t look odd. It’s a useful professional video editing trick and one that we use often. So that’s about all there is to it. The keys are to keep the first and second cut timelines to allow you to quickly respond to amendment requests, and secondly to be ruthless with your cutting. As mentioned, going with your gut is almost always the best way to choose the right quotes as you’re acting on emotional instinct and will be drawn to the quotes that connect with you on an emotional level. As we know these are the type of quotes that always form the most engaging viewing. 10 digital video production facts every business should know. Digital video production doesn’t need a big budget to create big impact! Big ideas don’t always need big budgets, and effective video marketing can be produced on limited resources. Be flexible in your approach and make sure you hire a creative producer to give you the most bang for your buck! Many corporate videos or pieces of video marketing content can be shot with a small crew (often just 2 or 3). The demands of these type of productions mean that kit is lightweight, portable and easy enough for a small crew to operate. However do be wary if just one person turns up with a camera and intends to direct, shoot, and record sound. Unless your budget is extremely limited and you can only stretch to a one man band then you should expect a crew minimum of two so as to maintain quality control. The standard day for most crew working in corporate video production is 10 hours. This is what you’ll have been quoted on. However a 12-hour day is very common and 14 and even 16-hour days are by no means unusual. If you’ve found the right producer they will be busy behind the scenes way before the shoot begins. They will be doing their homework on the subject matter and checking out any and all possible variables that could affect the shoot day. See our guide to pre production for more information on this. A video producer will know more than just how to produce video! Again, if you’ve hired the right person you’ll find that they have a great deal of knowledge of target viewing habits, sector idiosyncrasies and sector history. They should have done their homework on your brief and be able to offer some valuable insight into how the film can connect with the intended audience based upon their research. In the early days of HD digital video production, ‘high definition’ used to mean the resolution was either defined as 1280×720 pixels (the lower end) or as 1920×1080 pixels (full HD). Today, we have cameras capable of shooting up to six times the quality of what we used to call ‘full HD’. The majority of online video marketing content is delivered at 1280X720 but this will change as 4K becomes commonplace in the home and online. So think about how much longevity you need from your film in case you need to future proof it by shooting in 4K or above. A good producer will anticipate as many issues as possible when overseeing the shoot, but inevitably there are some things that will just happen unexpectedly and everyone will need to take that on board. Small changed such as camera angle, lighting etc come with knock on effects so dot expect things to happen quickly when shooting. Digital non linear editing is powerful and much quicker than the old analogue approach. However don’t confuse the software used with other applications that you may be familiar with. Changing a logo in photoshop can be a quick process but in video it will require rendering, exporting, compressing and probably uploading before you will be able to view the small change you requested. In the world of video marketing it would be great to be able to attach a HD video to our emails and simply send this straight out to our viewers. But sadly, this is just not going to happen. Even with todays powerful compression methods video files will usually be far too large to email (especially if they are HD). A better practice is to email links to the film once you have uploaded or embedded it onto an online platform (see our guide for tips). So there you have it. Hopefully you’re now either slightly more enlightened about the process of digital video production than before. But do email us if you have any questions about the process as we’re always happy to help out. Event Videography and location shooting comes with a particular set of challenges that can, if not managed correctly become a nightmare and unravel your shoot. Here are a few thoughts on key factors you need to consider when filming on location, and how to deal with them. Whether you are in a field, in an office or in a studio, for event videography you need to know what power options are available. If you want to run lights and charge batteries, knowing the availability and type of power supply that you can tap into is key. If your location is outside then obviously weather is going to be a factor. Too much rain and you simply can’t shoot, too windy and you’ll struggle with sound, too sunny and you could get more light than you want or presenters who squint! Always check the weather 48 hours in advance and always have a back up plan! If your location is in the middle of nowhere you need to factor in the logistics of physically getting your crew and equipment there. Likewise if you’re in the middle of a major city then parking, congestion and road works are something you’ll need to have thought about. Also make sure you can actually get your kit to where you want to film. If you’re in a business location check to see what floor you are on. If you’re high up make sure there is a service lift to get all the shoot kit in. If you are outside check the ground condition (especially if some of your kit is on wheels). One thing’s for sure, people can be the chaos theory element of location shooting and event videography– especially if you’re outdoors in an area that has public access. We once spent hours setting up a shot of a fitness model running through a beautiful field only to have a family decide to have their picnic right in the background of our shot! You can’t control people who are not part of the shoot and they can cause physical and audible issues with your filming. You’ll need some sort of permission wherever or whatever you are filming. Make sure you’ve cleared all land and buildings that will be appearing in your shots. Filming under a flight path! Very loud air conditioning units! Do as many checks as you can to ensure you’ve checked for every possible noise issue. If you are shooting outside check the position the sun will be around the scheduled shoot time (you can actually get an app for this that makes it easier). Low sun can give you hard, flat light, and the noon sun wont do any presenter or interview subjects any favours due to the ugly downward shadows it produces. Accidents do happen so if you are planning to shoot somewhere remote than ensure you have a good first aid kit with you and a trained first aider. Taking the “it’ll never happen to us” approach WILL catch you out one day so make sure you’re prepared. Finally, crew need to eat and go to the loo now and then so factor this into your event videography planning. Again if you are remote consider whether you need to bring in toilet facilities and make sure you keep your crew well fed! Hungry crews get tired and tired crews make mistakes! So there you go. 10 simple things that can leave your shoot in ruins if not considered and factored into your production.